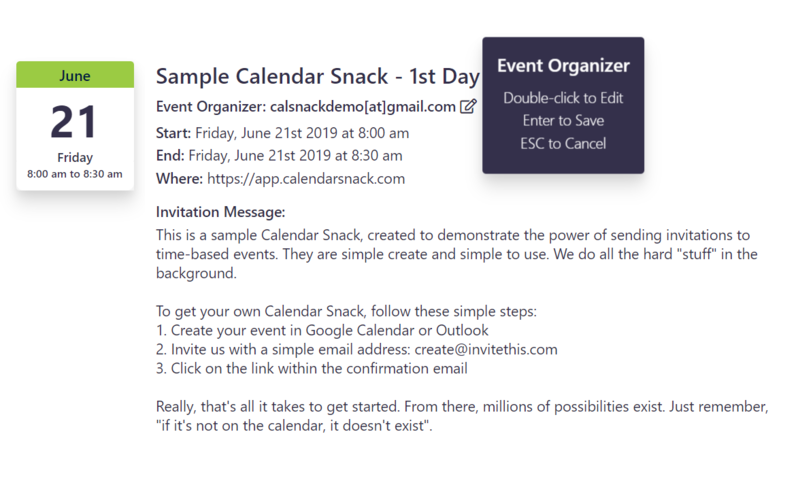 The first question you may have when using Calendar Snack is “where do I create my Event?”. We made a decision early on, that Google and Microsoft already have two leading “tools” to create Events. And most business professionals use those tools today – and on a daily basis. We could never create a “better” creation tool, and then hope to have it available on every device – desktops, laptops, pads, phones – and cover every operating system. To go down that path would be to spend the majority of our time developing a solution that has already been solved. So, we took a different path. Allowing you to create an Event with the application you know best – We’ve created events on iOS and Android phones, and on Windows 10 and MacOS. Use either Microsoft Outlook (any version) or Google Calendar – it’s your choice. Title: The first key element for your Event is the Title. We’ve never really thought about this field very much, because we are usually sending email (and we focus on our headline). But since you will be sending a direct calendar invitation, the Title becomes your email headline. Follow the same rules you would use for crafting a headline for your email campaign – not it’s just focused on your Event. Start DateTime / End DateTime: This should be the exact time of your Event. Currently, our representation of your start/end works best if it is a single time slot, rather than a multi-day Event. We will soon have more “designs” to use if your event is multiple days. 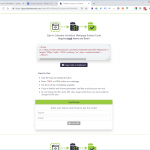 Location: If it’s online, just put paste the URL, if it is a physical address, just the address – no other information is required. 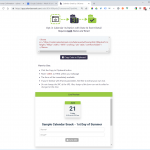 Notification & Reminders: We have found through our testing, that many calendars will strip any reminder information you include in your Event. For the most part, reminders are becoming more and more controlled by the Invitee (receiver of the invitation). So, just keep it as the default for your purposes with Calendar Snack. 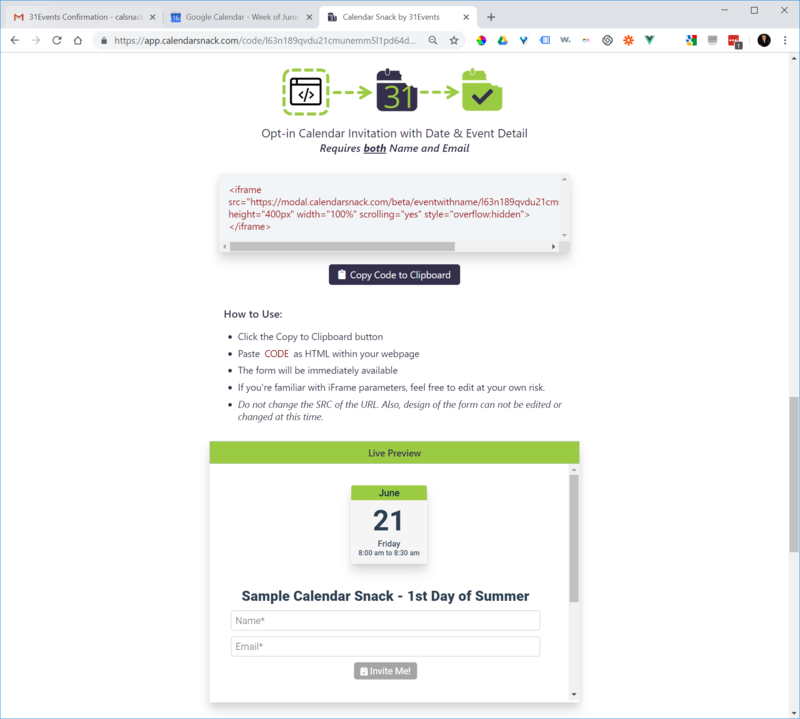 Use of Special Calendars or Free/Busy Time: We tested several ways to “name” a calendar or to designate time as Free or Busy. 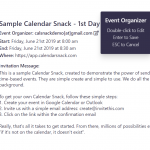 We decided to not use those features for Calendar Snack and keep it as simple as possible. Notes/Description: Use this area to provide details about your Event. 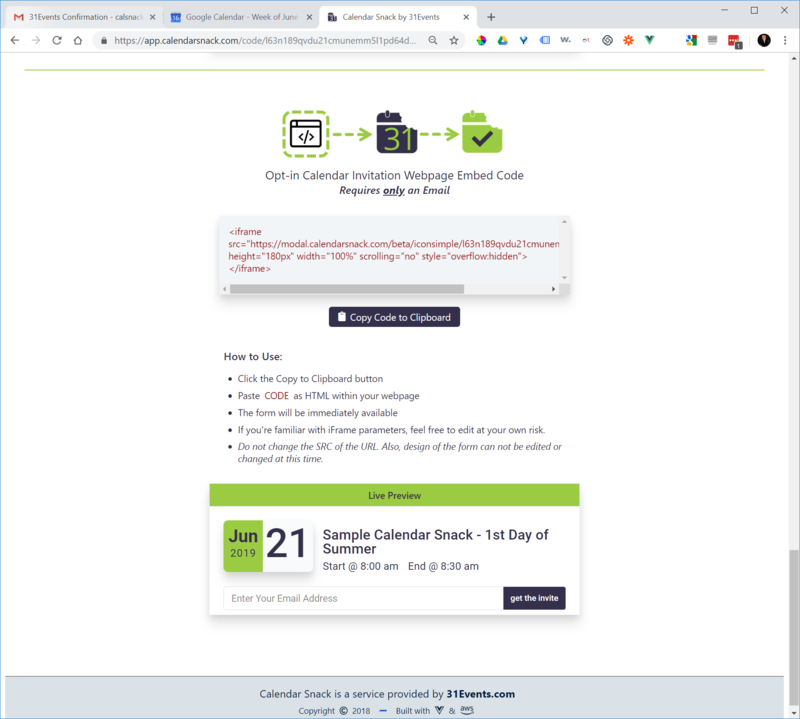 It remains with the Event and can be seen when the invitation arrives in the email inbox, and when it is viewed in the Calendar itself. Add instructions on how to attend, links to additional resources, potentially an Agenda. 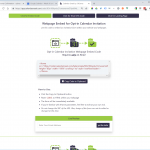 We found elaborate text formatting does different things on different calendar clients (and many of them unexpected) – so we pretty much “strip” out the formatting. That’s it. We suggest using every piece of information you can for your Event and help Invitees get to the right place at the right time. 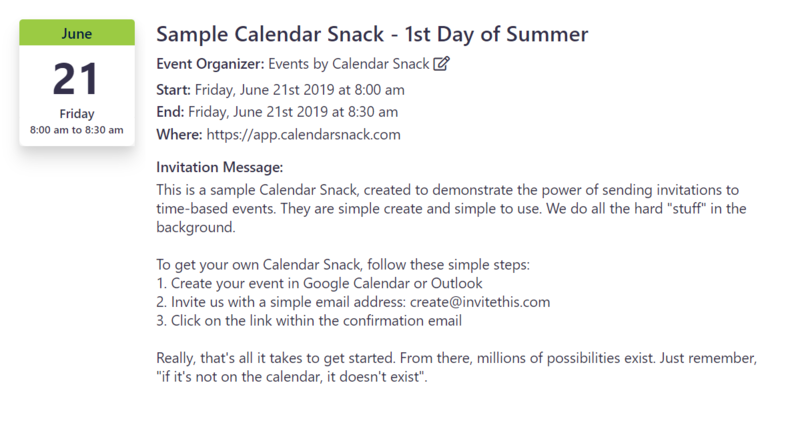 Creating a Calendar Snack is easy (along with free), so if you make a mistake, just create another one. We will send you new details for the newly create Snack. But the one thing you can’t (easily) change with your calendar client is the organizer name. That’s why it is the only field we allow you to Edit via the Summary Page. The newly edited field is immediately available and will be the Organizer Name sent with any new invitations. One of the toughest things to do is provide “options” when it comes webpages. Everyone has their own design, layout and brand guidelines, and it’s impossible to provide a fit for everyone and every website. 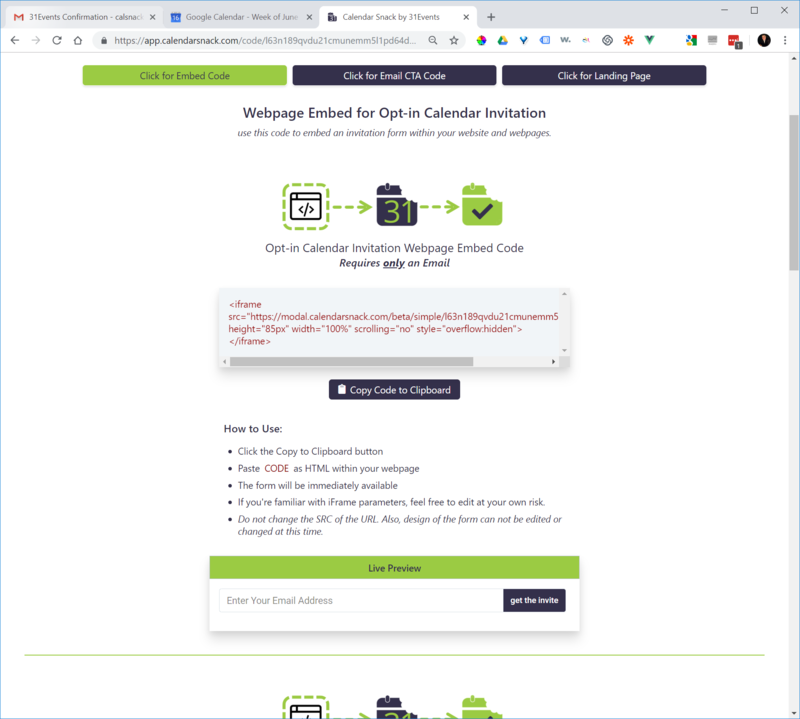 But we wanted to provide an easy solution for you to send calendar invitations directly from your webpage – so we provide code to do just that. 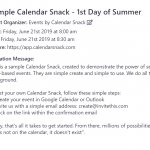 If you can do a simple “copy-n-paste” or have experience with embedding YouTube videos – you can use one the Calendar Snack embeds. 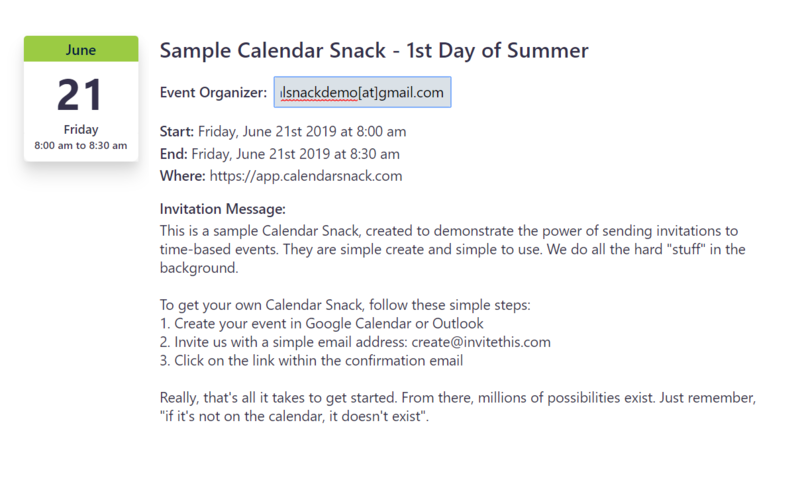 If you use the simple email input box, simple design around it with your event information, and your own call to action. 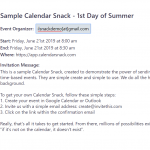 When someone puts their email address into the box, they will receive a calendar invitation in their email inbox. From there, they can choose to take the appropriate RSVP action. 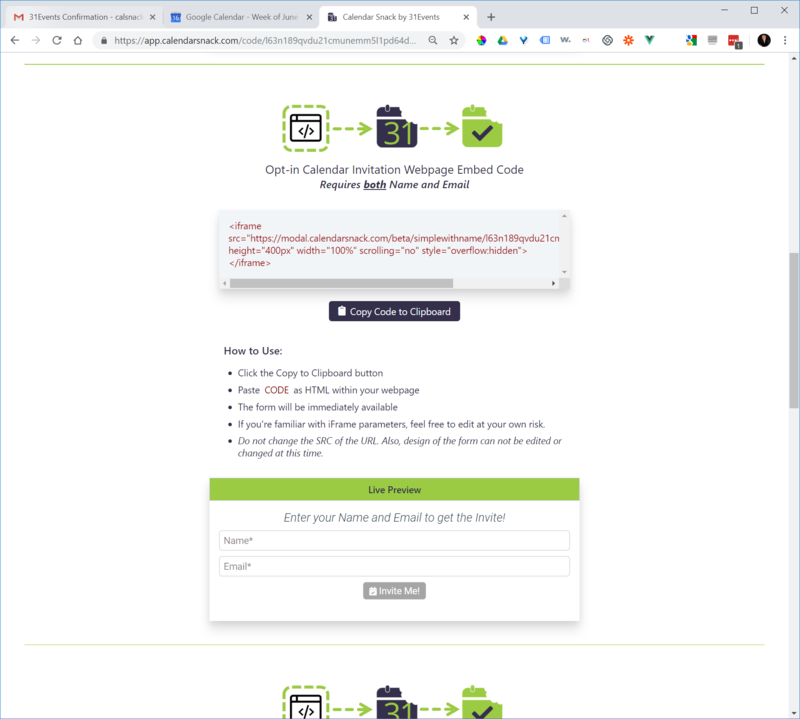 To use the Opt-In Embed – just click the “copy to clipboard” button, and the copy the iFrame within your webpage, it will be available immediately. 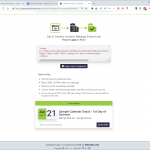 There is live preview of each Opt-in Embed, so you know exactly what you will be seeing on your webpage.